DEXI-BLISTER® is a technology allowing the preservation of ingredients highly susceptible to deterioration. The presence of an additional lamina with desiccant particles in the blister pack ensures preservation of ingredients and protection from humidity. 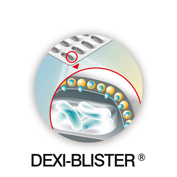 DEXI-BLISTER® is a technology based on an innovative blister pack composed by an additional lamina with desiccant particles. The technology provides preservation of ingredients susceptible to deterioration due to environmental factors such as humidity and temperature. This technology aims to enhance the stability of active ingredients. DEXI-BLISTER® is particulary useful when it is applied to probiotics, in order to avoid loss of viability during storage.